I actually saw this movie several months ago. I'm not sure why it took me so long to write the review. I still don't have any idea what I'm going to say, so forgive me if this is a little rambling. I like this movie a whole lot. Lilo and Stitch is surprising and genuine and weird and quirky. In other words, it's not at all like the recent Disney movies. Watching it, in fact, it felt more like a 2D-animated Pixar movie, because it had the same strength of character and actually funny humor that has been missing in Disney's recent efforts. The characters are by far the strong point of this movie, because after the initial setup and until the final climax, really nothing happens in this movie other than character interaction. Lilo has the typical Disney hero setup in that she's a loner. She doesn't feel she quite fits in. But that's the only thing typical about her. The first time you see her another girl makes fun of her, and Lilo jumps on the girl and punches her repeatedly in the face! She has a doll that she basically made herself. It has an oversize head, so she says it has an horrible brain tumor. 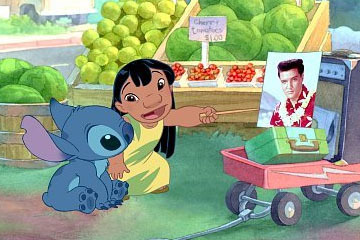 Later in the movie when she tries to teach Stitch to be good, she figures that since Elvis was a good guy, she should try to teach Stitch to be like Elvis. All this weird stuff. It's exactly the kinds of things that usually would get thrown out in Disney story meetings for being too weird that make this movie so good. The family relationship in the movie is fantastic. Lilo is of course an orphan (because there can't be a Disney hero with more than one living parent). She is being raised by her sister, Nani, who is barely more than a kid herself, and really resents the fact that she has been forced to grow up so fast in order to take care of Lilo. Early in the movie they have a knock-down, drag-out argument/fight that actually felt like a real family fight, not some Disneyesque family fight. The complex relationship between these two characters (and David, the man who wishes he were Nani's boyfriend) are the backbone of the whole movie. Without it, the movie would have fallen flat on its face. Stitch, voiced by writer/director Sanders (because I guess Frank Welker was busy), is very well done. His conversion from an engine of destruction to a member of Lilo's family is actually believable for one reason. And here it is: The first thing Stitch is designed to do when he lands on a planet is find a large city and block up its sewer system before going on to other major acts of damage/mishchief. He lands on a Hawaiin island that has no big cities, and so suddenly his entire purpose for living no longer exists. At first he merely goes along with Lilo so he can "hide in plain sight" from the two aliens sent to retreive him (Kevin MacDonald from Kids in the Hall and perennial Disney favorite David Ogden Stiers). Eventually, though, his lack of purpose begins eating at him more and more, and so when Lilo tries to turn him good, he's actually willing to go along with it. This movie flies in the face of convention. It seems like an independent animated feature, not something that Disney would put their stamp on (except that it has Disney's huge budget backing it up).